RKO 281 is a 1999 American historical drama film directed by Benjamin Ross and starring Liev Schreiber, James Cromwell, Melanie Griffith, John Malkovich, Roy Scheider and Liam Cunningham. The film depicts the troubled production behind the 1941 film Citizen Kane. The film's title is a reference to the original production number of Citizen Kane. In 1940, Orson Welles (Schreiber), RKO studio head George Schaefer (Scheider), and screenwriter Herman J. Mankiewicz (Malkovich) struggle in making what will be considered as the greatest American film of all time, Citizen Kane. Welles and Mankiewicz attend a party at Hearst Castle where meeting the hypocritical and tyrannical William Randolph Hearst (Cromwell) gives him the inspiration to make a film about his life. Mankiewicz is against it as he knows Hearst's wrath will be horrible, but Welles says this is the film. Mankiewicz finally agrees. After learning from Hedda Hopper, who had viewed a press screening, that Welles' film is actually a thinly veiled and exceptionally unflattering biography of him, publishing tycoon Hearst uses his immense power and influence to try to deny the release of the picture. Hearst's mistress, actress Marion Davies (Griffith), endures the embarrassment of having their private lives exposed and vilified, while also offering Hearst consolation and even money when his finances begin to diminish (by selling all the jewelry he gave her and giving him the money in a check). In the end, after considerable delays and harassment, plus the disintegration of the professional relationship between Welles and Mankiewicz and a costly blow to Schaefer's career, the film is finally released. Its publicity is muted by Hearst's ban on its mention in all his publications, and its commercial success is limited. Welles, however, ultimately has the satisfaction of having created one of the most critically admired films of all time. Producer Ridley Scott wanted to film in the Hearst Castle, but was denied. 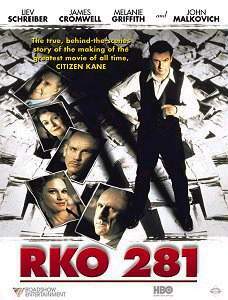 RKO 281 was filmed in the United Kingdom, mostly around London. The Gothic stairwell in Hearst Castle was filmed in the St Pancras Chambers, attached to St. Pancras Station. Hearst's private quarters and office, including a marble fireplace, were filmed in the high-ceilinged Gamble Room in the Victoria & Albert Museum. The fireplace seen in the room was saved from Dorchester House prior to that building's demolition in 1929. The Hearst castle dining hall and ballroom was filmed in the Great Hall of the London Guildhall. On aggregate review site Rotten Tomatoes, the film holds a "fresh" rating of 93%, based on 14 reviews. The film won Best Miniseries or Motion Picture Made for Television at the 2000 Golden Globes, and also received a Emmy Award for Outstanding Casting for a Miniseries, Movie or a Special. Score composer John Altman also won a Emmy Award for Outstanding Music Composition for a Miniseries, Movie or a Special. ^ a b Gritten, David (1999-09-05). "The Los Angeles Times Television Section September 05, 1999". Retrieved 2010-10-23. ^ "The City of London - Guildhall". Archived from the original on May 13, 2008. Retrieved August 24, 2012. ^ "RKO 281 Review". Rotten Tomatoes. Retrieved August 24, 2012.